Cat health: What’s wrong with Grace the kitty? My 4-year-old cat Grace started vomiting sporadically when she was only around 1 ½ years old. I didn’t get too excited about it since it was so infrequent and she was showing no other signs of illness. As time went on, though, the vomiting became more frequent, so I knew she had a serious cat health problem. Then the diarrhea started. Eventually, Grace was diagnosed with inflammatory bowel disease (IBD), and she’s been a challenge to treat ever since. IBD is actually a group of gastrointestinal disorders, usually chronic in nature, which are characterized by an increase in the number of inflammatory cells in the lining of the digestive tract. If the inflammation predominates in the stomach or small intestine, chronic vomiting is typically the main symptom. Inflammation in the large intestine usually causes chronic loose stool or diarrhea. Some unfortunate cats, like my Grace, have inflammation in all areas resulting in both vomiting and diarrhea. In my experience, chronic vomiting is most common. The cause of IBD is unknown. Genetics, nutrition, infectious agents, and abnormalities of the immune system may all play a role. It is interesting to note that two of Grace’s littermates have vomiting issues, although not officially diagnosed with IBD yet. Most cats with IBD appear perfectly healthy otherwise, so owners may not realize their cat is sick. Many people buy into the myth that it’s normal for cats to vomit. It’s not unusual for me to diagnose a cat with IBD that has been a “vomiter” its whole life. That’s why it’s important to tell your veterinarian about any vomiting than is more than an occasional hairball, before it becomes serious for your cat. Being sure to invest in cat insurance prior to these kinds of issues can also help you afford the best care for your kitty. Severe IBD can cause weight loss and change of appetite, and in some cases can even progress to cancer of the intestines. To rule out other causes of gastrointestinal disease, your veterinarian will perform blood tests, stool examinations, x-rays and possibly other tests. Because diagnosis can be expensive, it’s important to research pet health insurance early on. Common diseases such as chronic kidney failure, hyperthyroidism, and pancreatitis can also cause vomiting and diarrhea. A definitive diagnosis of IBD is only possible by intestinal biopsy, which is best accomplished using minimally invasive endoscopy under short anesthesia. A combination of dietary management and medical therapy will successfully manage IBD in most cats. The realistic goal is control, not cure, and treatment tends to be life long. The costs can add up for chronic medical conditions like IBD, so pet health insurance plans purchased in the younger, healthy years can really be a benefit later on in life. Sensitivity to food antigens contributes to the gastrointestinal inflammation in some cats, so a change in diet often provides symptomatic relief. A hypoallergenic diet is usually one of the first steps in the initial treatment. Grain free diets, highly digestible diets or fiber diets may also be helpful. Your veterinarian can help guide you to the best diet for your cat’s particular situation. Many medications can be used to control IBD. Corticosteroids are the treatment of choice in most cases. These have potent anti-inflammatory and immunosuppressive properties with relatively few side effects in cats. Oral prednisolone is the steroid I use most frequently to treat IBD in cats, and it has literally been a life saver in many cases. Antibiotics such as metronidazole or tylosin can be used in combination with steroids for better control. B vitamins and probiotics may also be helpful additions. Severe or non-responsive cases may require more potent immunosuppressive drugs such as cyclosporine or chlorambucil. A newer drug called Cerenia may also be effective in combination with steroids. I have used all of these dietary therapies and medications for Grace’s IBD without full success. She is very sensitive to drugs, and several of them made her diarrhea worse. Her vomiting is fairly well controlled on steroids, but she stills flares up with loose stool. I continue to experiment with different treatments for her. Fortunately, she is the exception. The majority of cats respond fully and rapidly to basic medications with only occasional recurrence. If you think your kitty might have IBD, make an appointment with your vet right away. 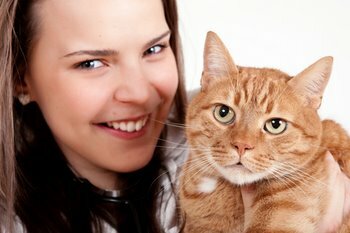 For more information about pet health and cat health insurance visit Pets Best Insurance: www.petsbest.com.